Today’s data centers have evolved to support a growing business, a dynamic workforce, and constantly changing business demands. IT and data center administrators are constantly tasked with creating a more resilient ecosystem capable of constant uptime and availability, especially for the mission critical data center. But it’s not quite as simple as that. New demands dictate that we’re far beyond just creating disaster recovery plans. We’re being tasked with delivering complete resiliency for our most critical environments. Fulfilling this mandate has typically involved the management of multiple, separate systems for disaster recovery, resiliency, uptime, security and more. However, as threats rise and systems grow more complex, there is an opportunity—perhaps even a requirement—to rethink the whole subject. Increasingly, IT managers are starting to think about IT systems resiliency as the overall goal rather than focusing on discreet spheres of disaster recovery, backup, security and so forth. In this whitepaper, we’ll look at how organizations can create workable IT systems resiliency strategies, how they can support new types of critical environments, and how to improve overall data center operations and management. 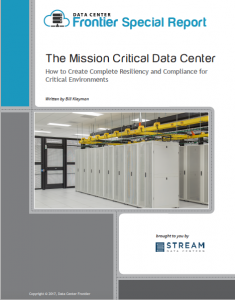 Download the new Data Center Frontier Special Report to learn how to create complete resiliency and compliance in critical environments.